“Activations” to get people together take a lead role at Moxy dc by marriott. bocce, drag brunches, tattoos and more? The Moxy will open at 10th and K streets, NW, on October 30. Renderings courtesy of the Moxy. 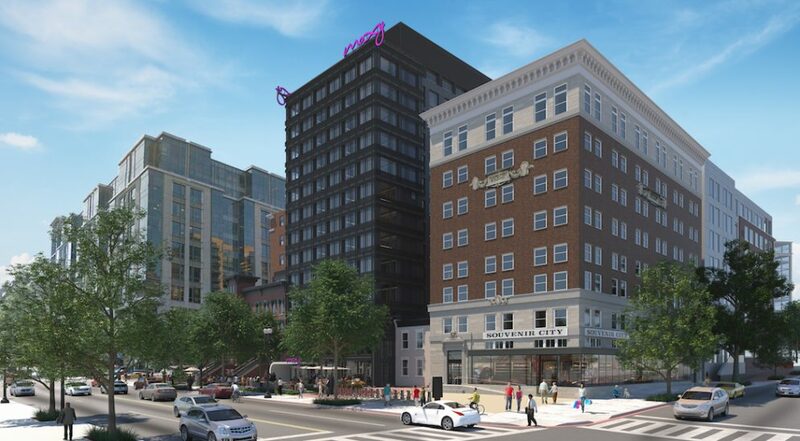 DC will get its first Moxy hotel, at 10th and K streets, NW on October 30th. The six-year-old brand from Marriott already has outposts in London, New York, Chicago, and dozens of other locales. Its Washington debut follows several other recent hotel openings aimed at hip, young professionals. Eaton DC—the resistance-themed property down the street at 12th and K—opened this summer. The Line arrived last year, as did Pod DC. Still more are on the way in the months ahead: Navy Yard is getting a Thompson hotel—a trendy boutique with outposts in places like Seattle and Nashville. And Richard Branson is bringing a Virgin hotel to Union Market. 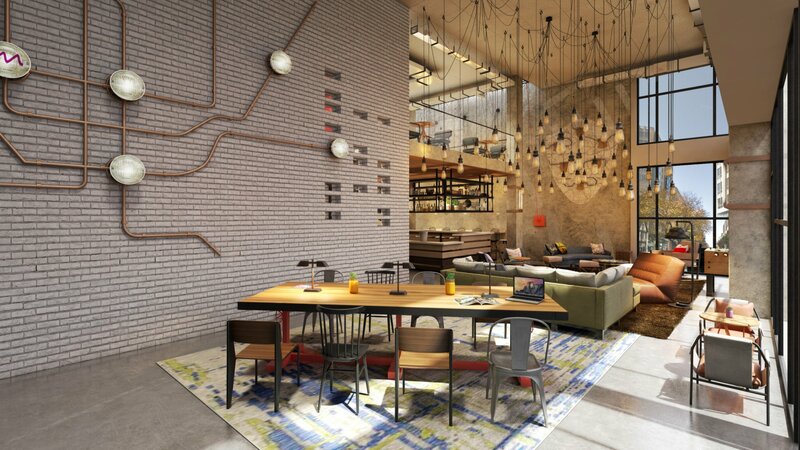 But the team behind the Moxy promises their property will stand apart from the rest, in large part with “activations”—their word for games and pop-up events designed to engage guests and encourage them to interact with each other—for instance, a bocce ball court in front of the hotel’s entrance on K Street. Pop-ups already planned once the hotel opens include a partnership with tattoo artists, in which they’ll set up shop to ink guests on premises. A fitness bootcamp hosted by the DC Rollergirls, and drag-queen bingo are on the agenda, too. 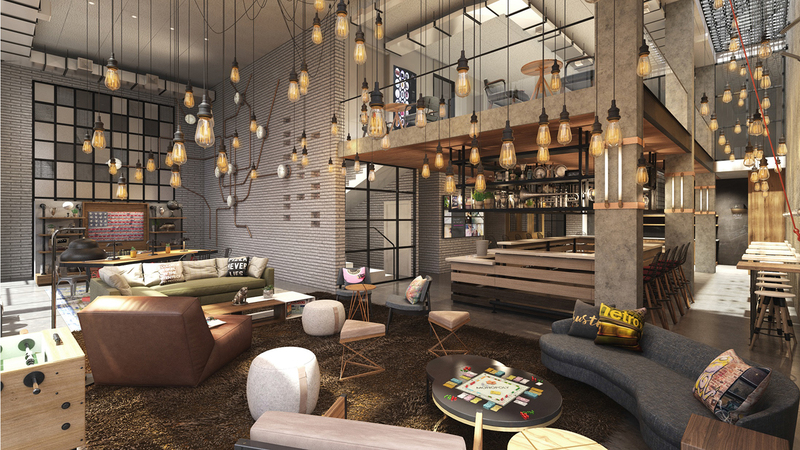 There will not be a check-in desk at the Moxy; rather guests will check-in at the lobby bar, where they’ll get a free welcome cocktail. The top-floor restaurant and bar will feature a retractable glass rooftop, though that space isn’t scheduled to open until spring 2019. Baltimore’s Atlas Restaurant Group will run it. The Moxy’s 200 guest rooms are divided between a historic 1870 brick building, and a newly constructed, modern building clad in black steel. Its interiors will skew industrial, with polished concrete floors, reclaimed wood paneling, and glass garage doors that open up the lobby to K Street. Here’s a look at what’s to come. A rendering of the lobby bar.